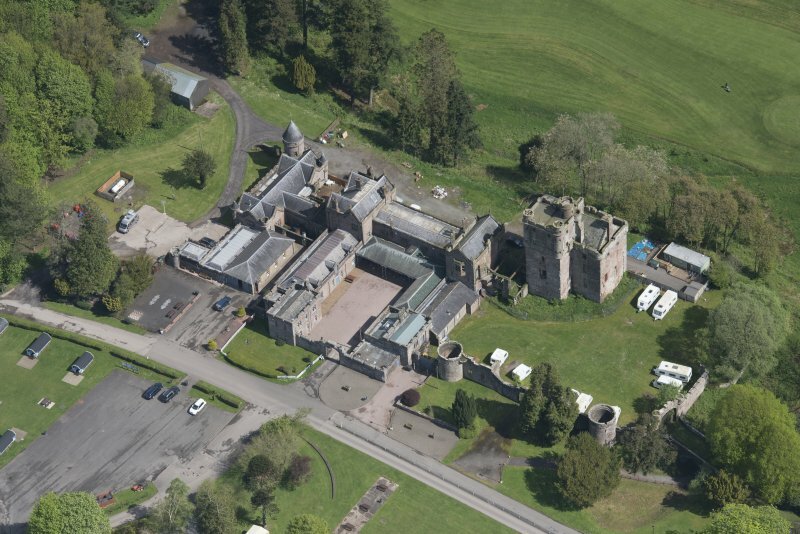 Oblique aerial view of Hoddom Castle, looking NNE. 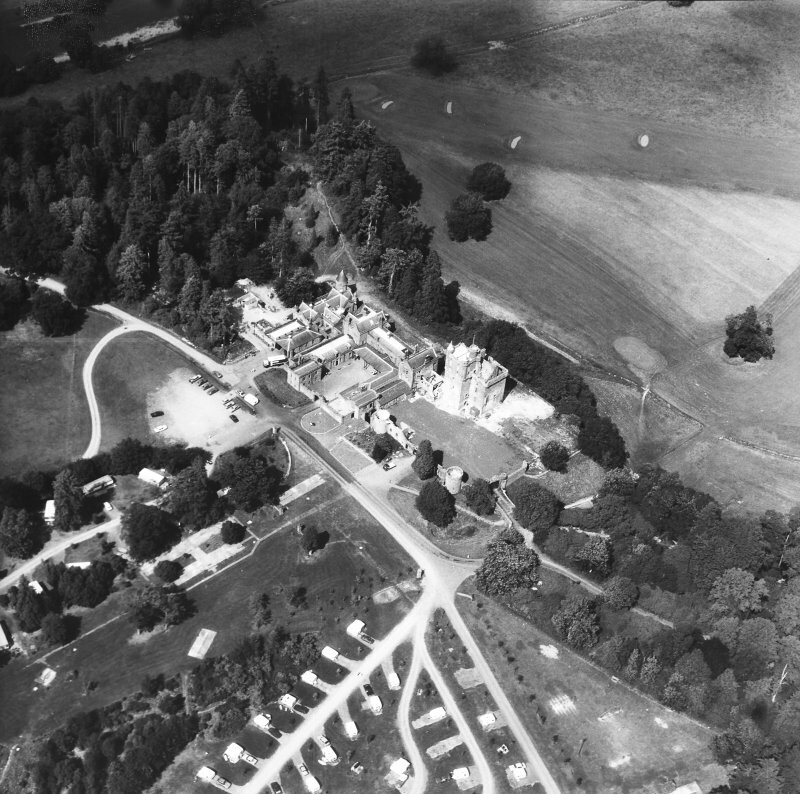 Oblique aerial view of Hoddom Castle, looking ENE. 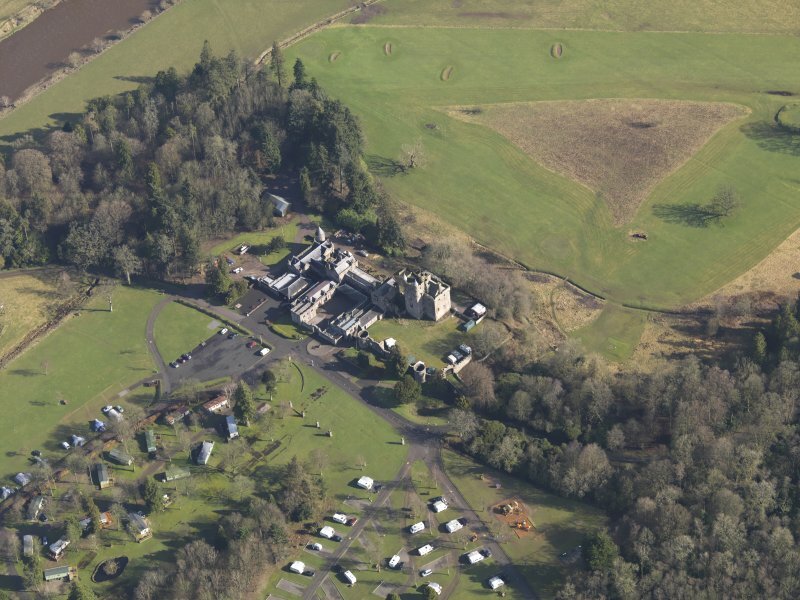 Oblique aerial view of Hoddom Castle and Hoddom Castle Golf Course, looking S.
View from S of Hoddam Castle. 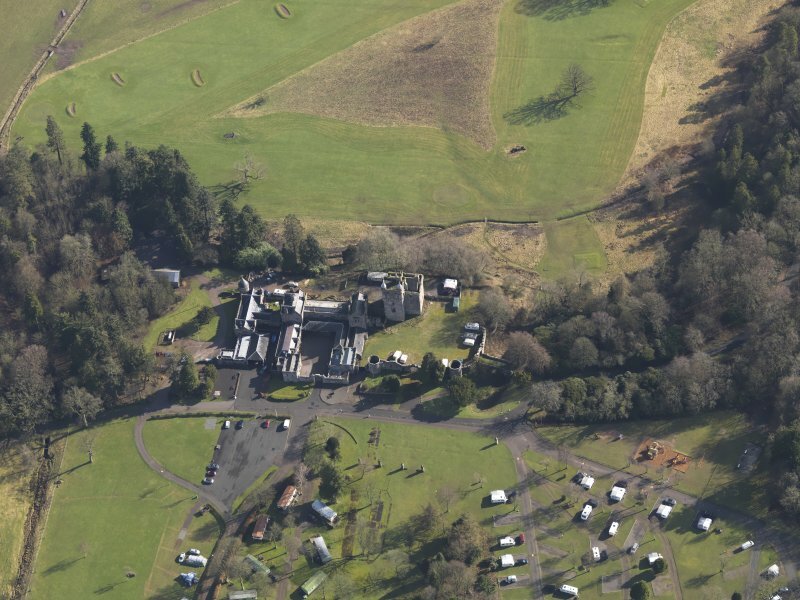 Oblique aerial view centred on the country house with the caravan park adjacent, taken from the WSW. 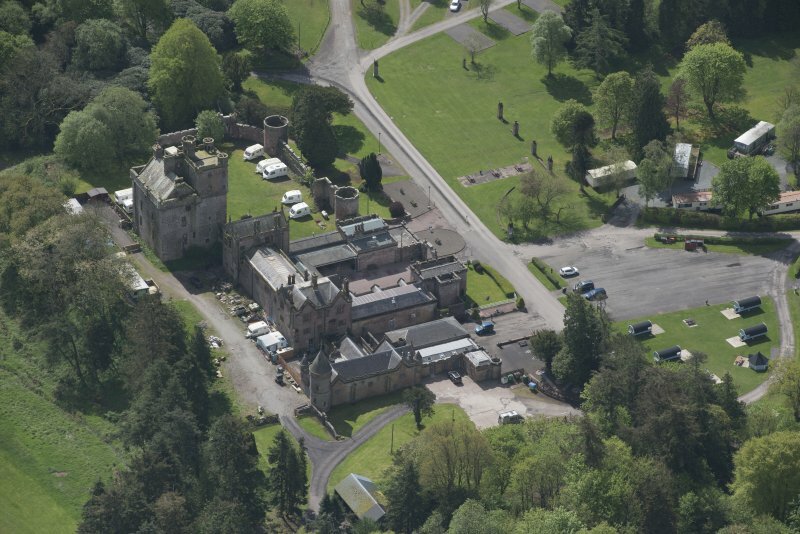 General view of tower house from SW after demolition of adjacent SW and SE wings. Drawing showing east elevation of new additions, Hoddom Castle. 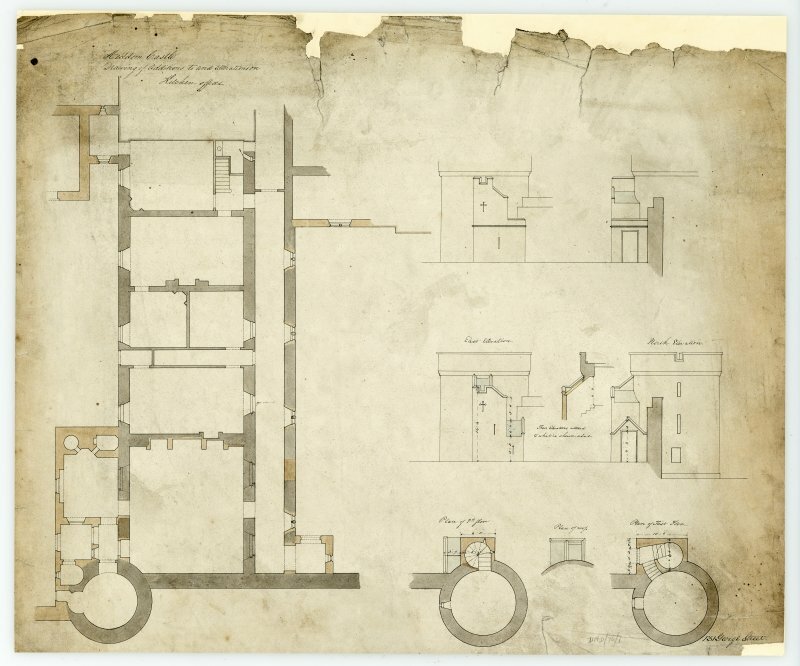 Drawing of plans and elevations showing proposed additions and alterations to kitchen offices, Hoddom Castle. 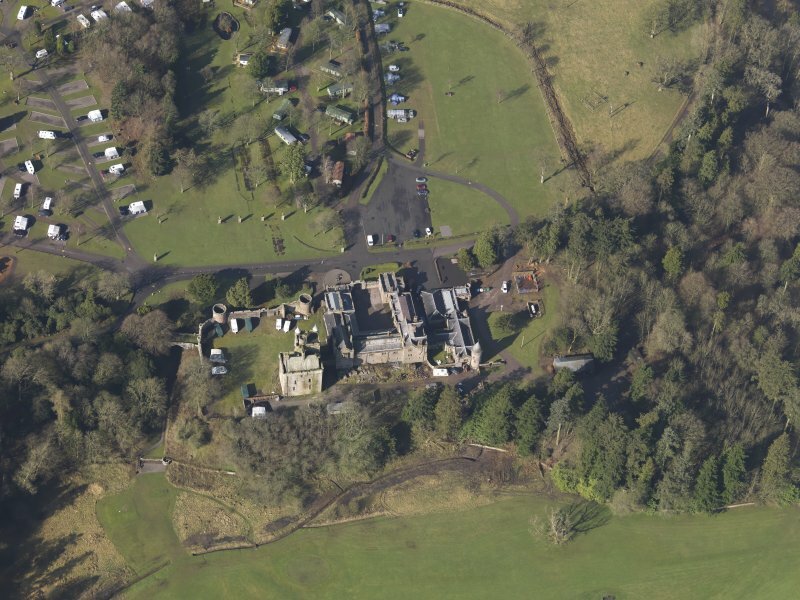 Oblique aerial view of country house from NE. 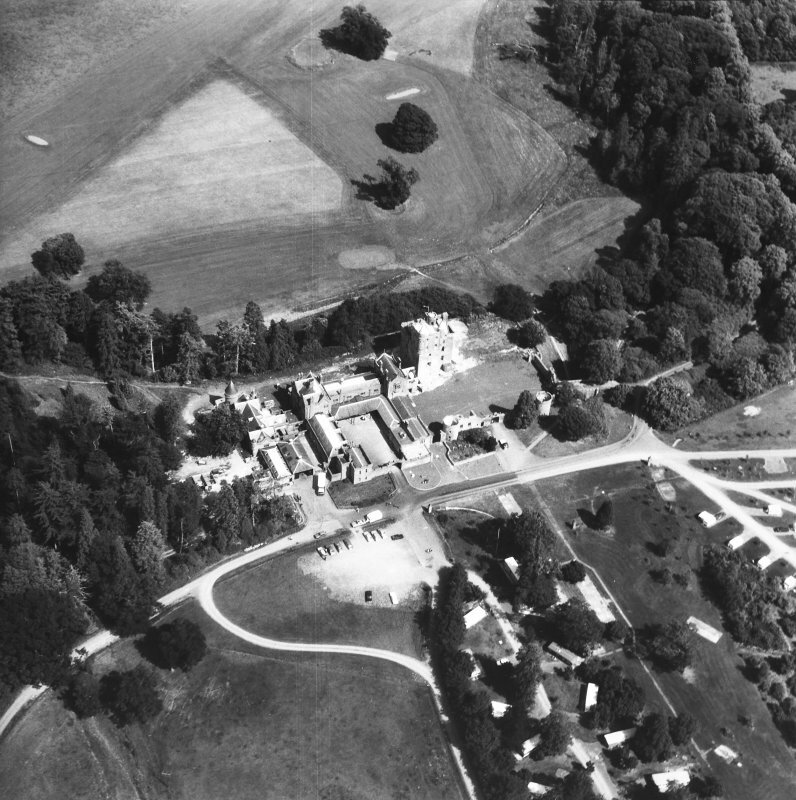 Oblique aerial view of country house from W.
Oblique aerial view of Hoddom Castle, looking NW. 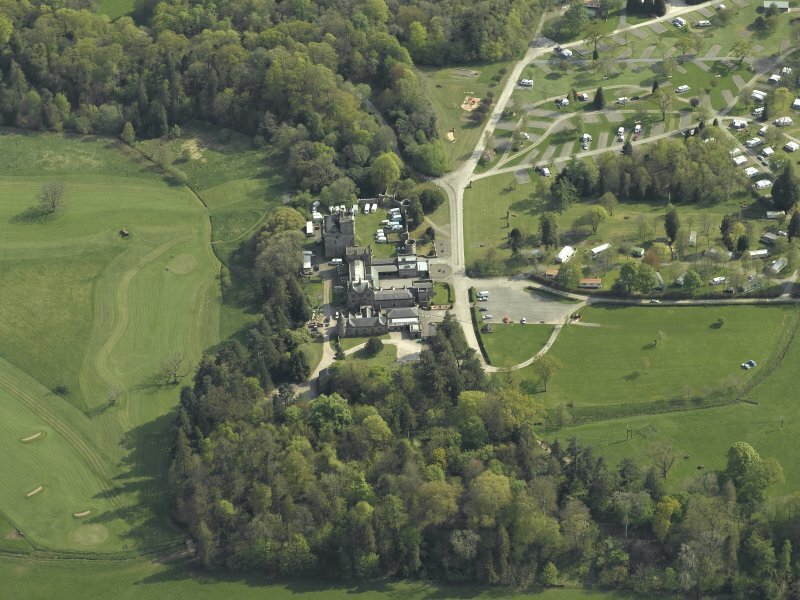 Oblique aerial view of Hoddom Castle and Hoddom Castle Golf Course, looking NNW. 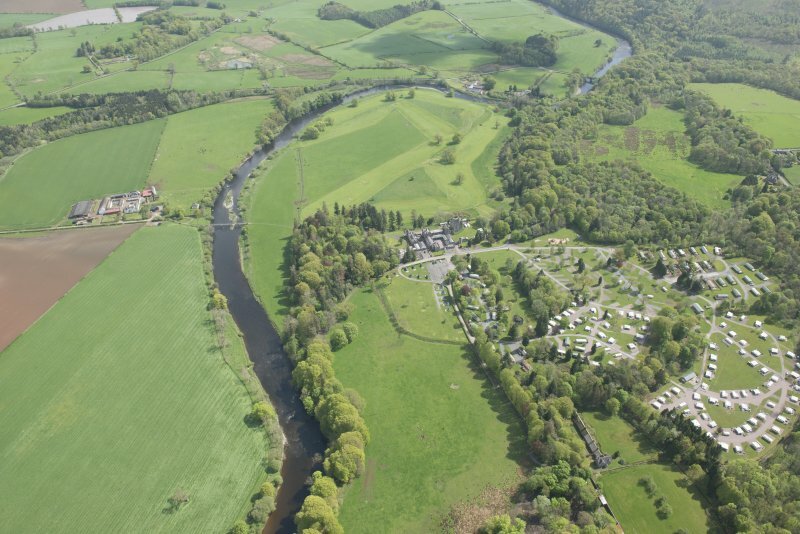 Oblique aerial view of Hoddom Castle and Hoddom Castle Golf Course, looking E.
Oblique aerial view centred on the country house with the caravan park adjacent, taken from the SSE. 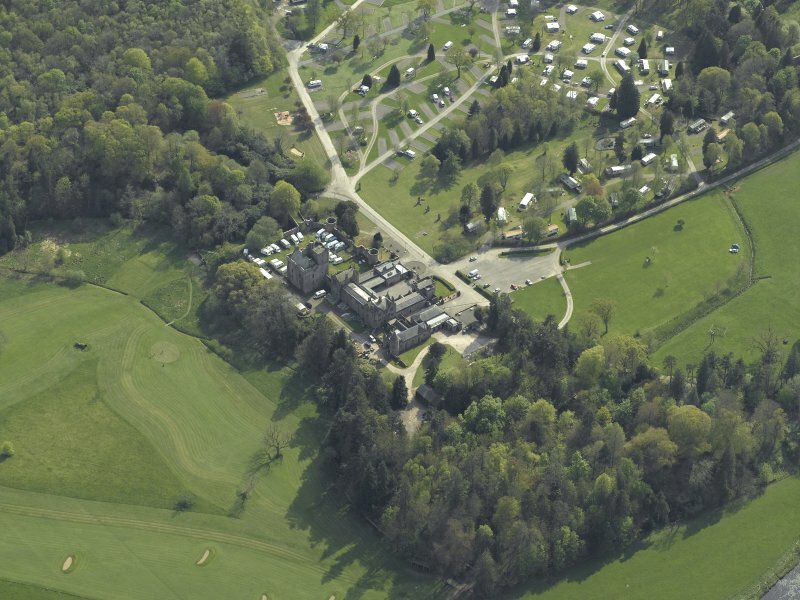 Oblique aerial view centred on the country house with the caravan park adjacent, taken from the N.
Oblique aerial view of Hoddom Castle, looking S.
Oblique aerial view of Hoddom Castle and Hoddom Castle Golf Course, looking NNE. 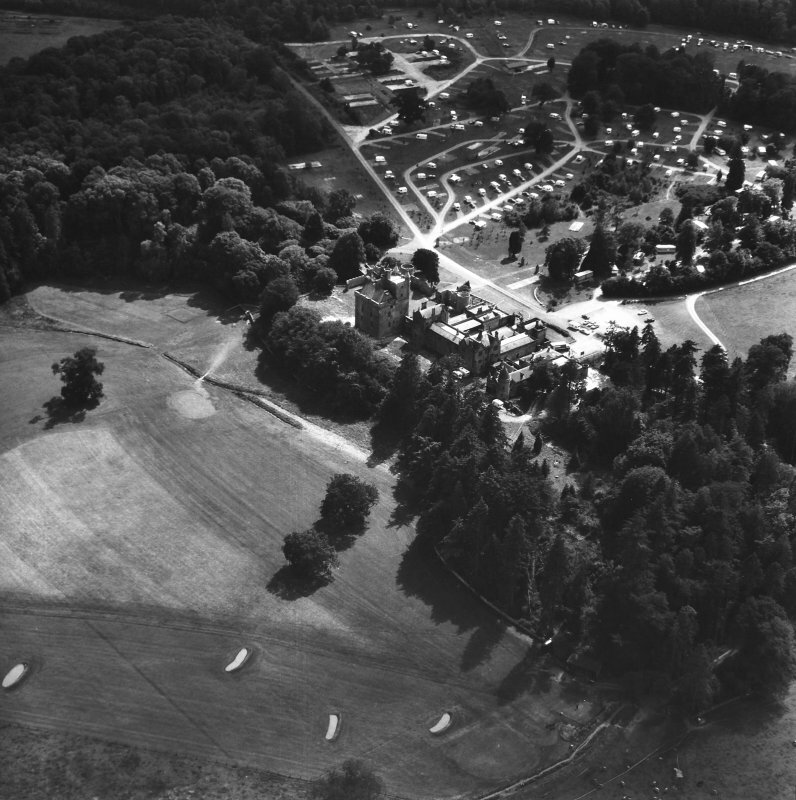 Oblique aerial view of Hoddom Castle and Hoddom Castle Golf Course, looking SE. 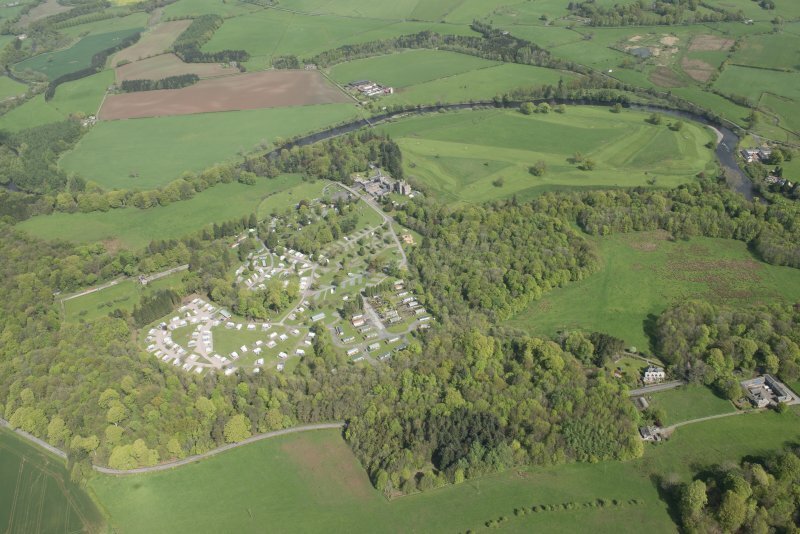 Oblique aerial view centred on the country house with the caravan park adjacent, taken from the NNW. 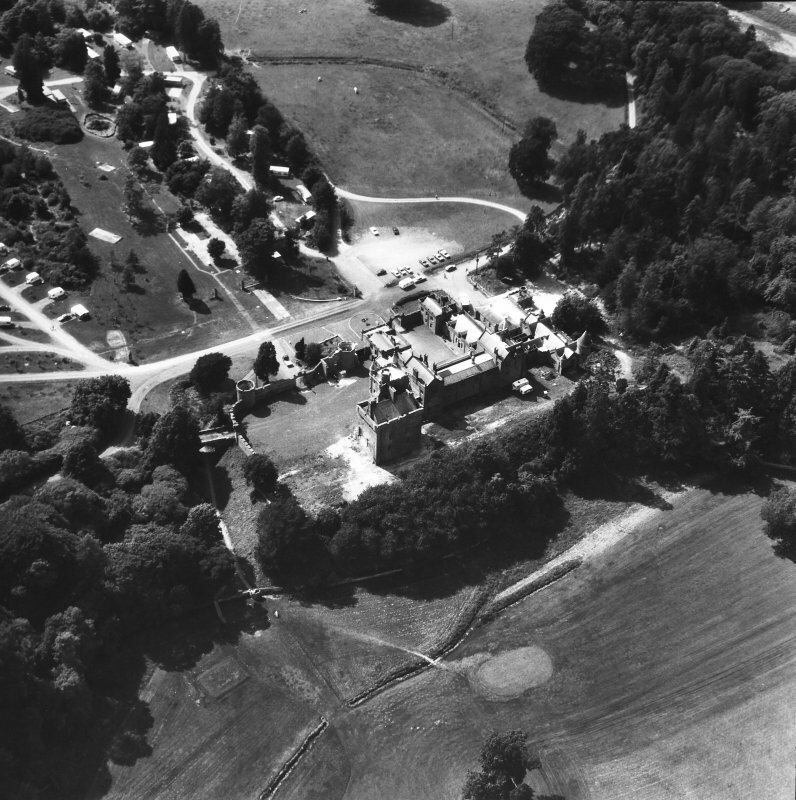 Oblique aerial view of country house from SW.
Oblique aerial view of Hoddom Castle, looking WSW. 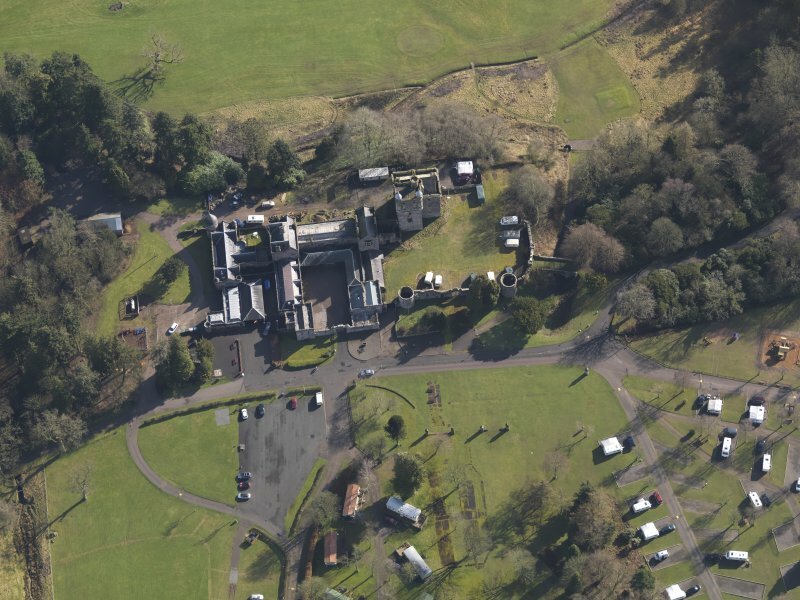 Oblique aerial view of Hoddom Castle, looking WNW. 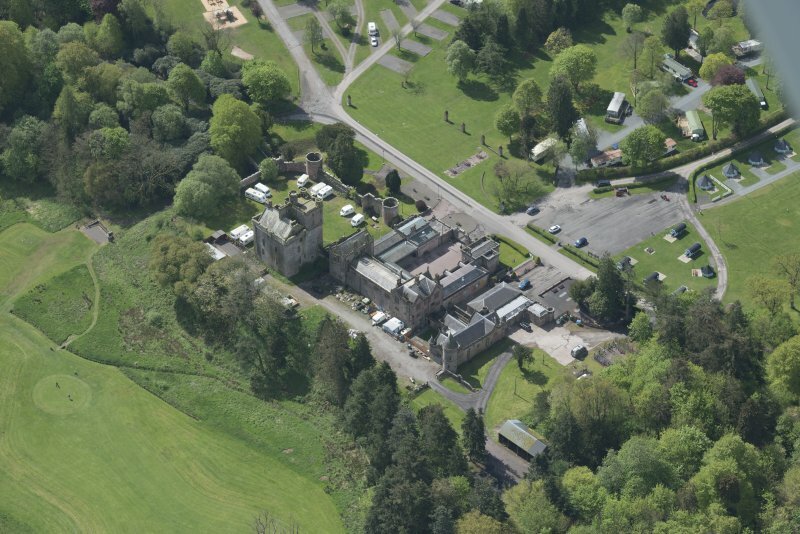 Oblique aerial view of Hoddom Castle, looking NE. 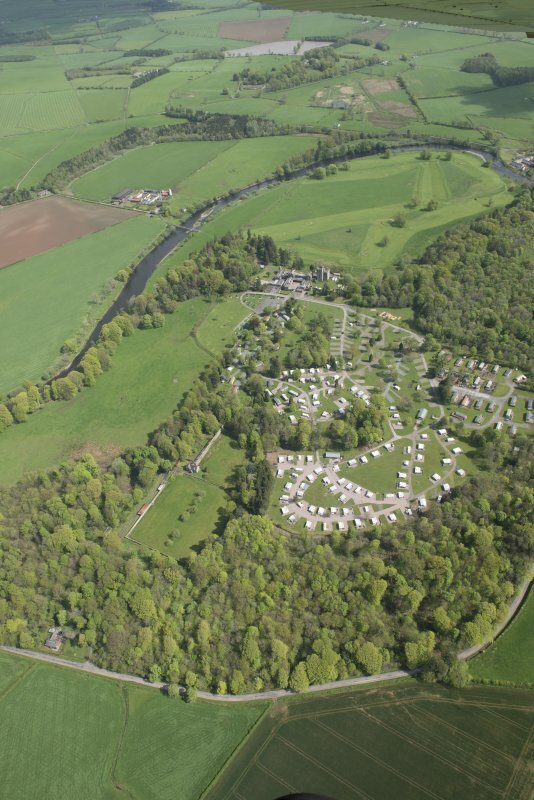 Oblique aerial view centred on the country house with the caravan park adjacent, taken from the NW. 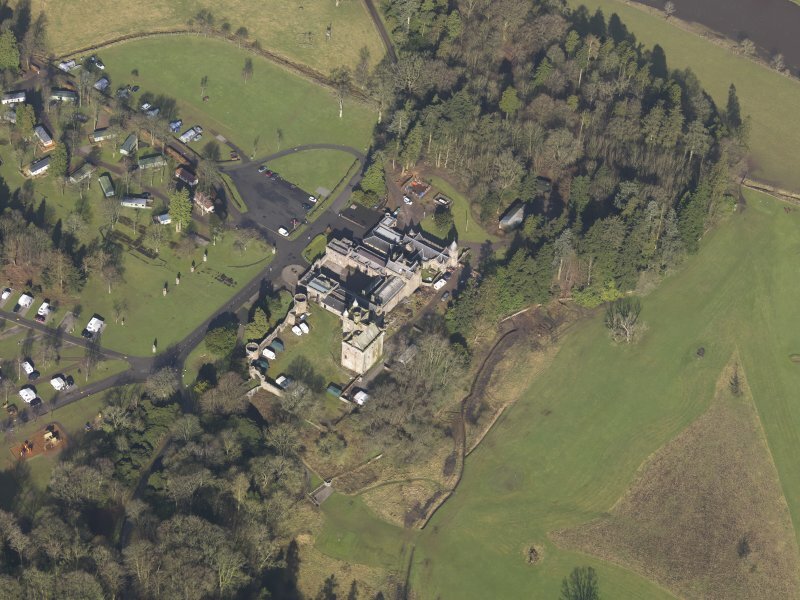 Oblique aerial view centred on the country house with the caravan park adjacent, taken from the W.
Drawing of plan of foundations showing proposed additions and alterations to tower house, Hoddom Castle. 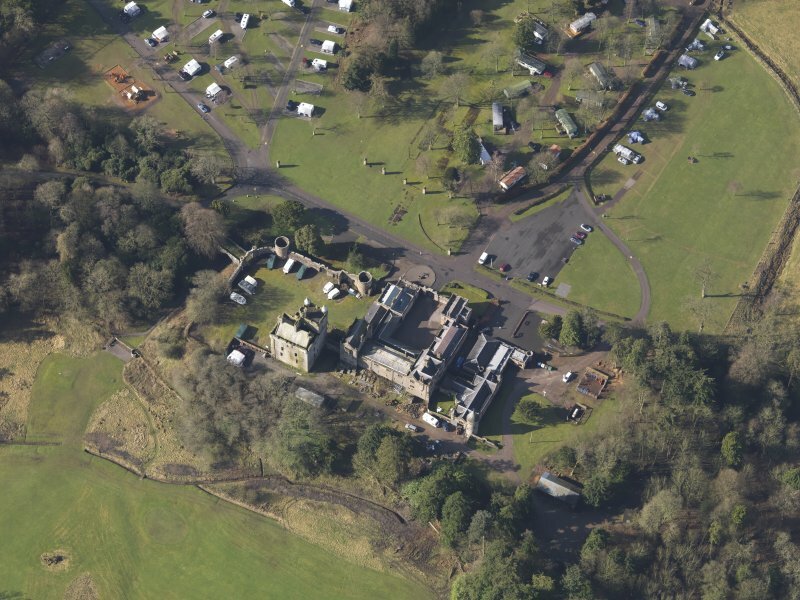 Oblique aerial view of country house from SE. Oblique aerial view of Hoddom Castle, looking SW.
Oblique aerial view of Hoddom Castle, looking SE. 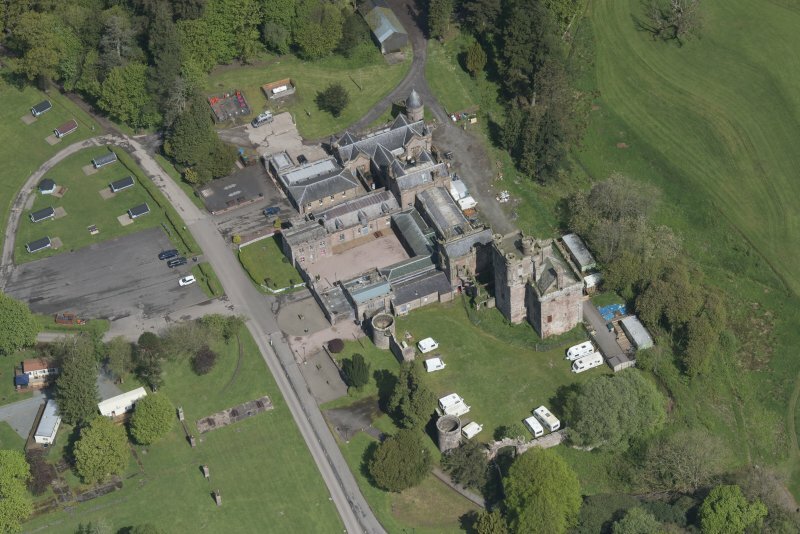 Oblique aerial view of Hoddom Castle, looking SSW. 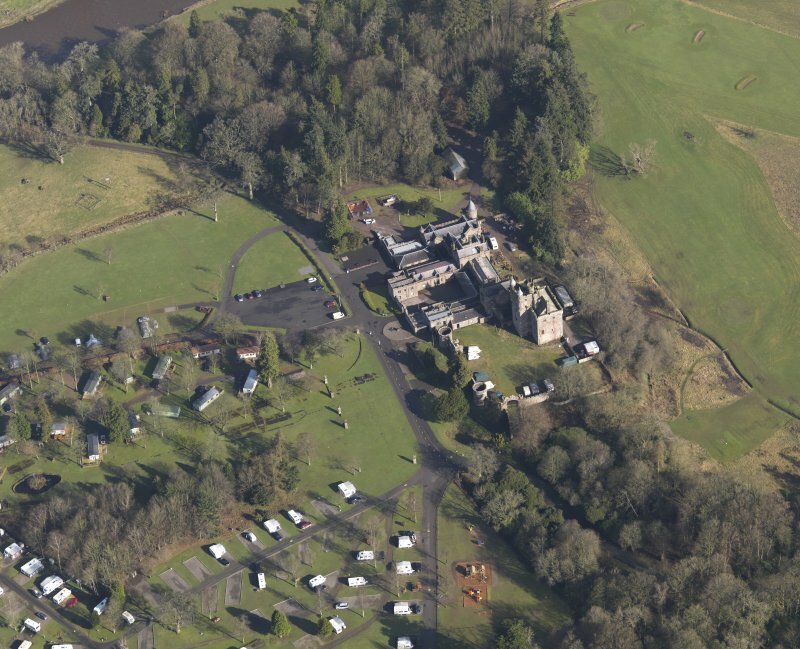 Oblique aerial view centred on the country house with the caravan park adjacent, taken from the SE. 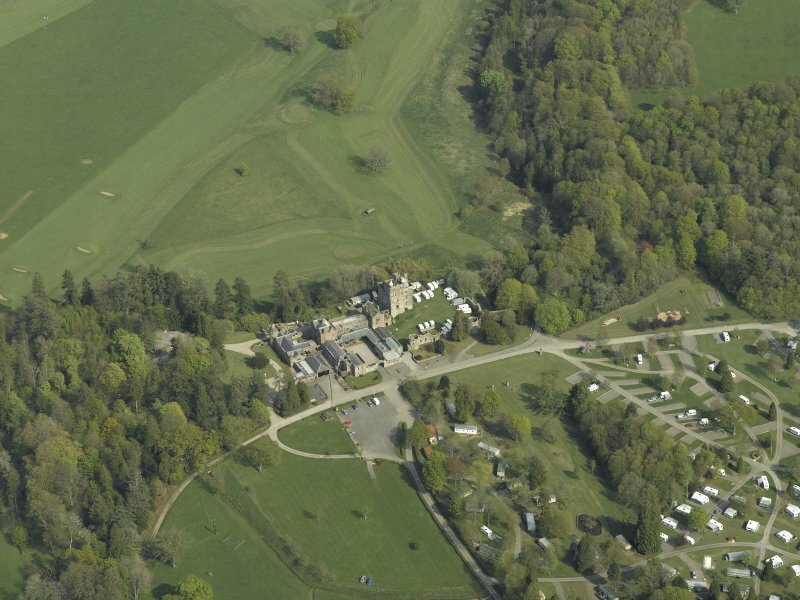 Oblique aerial view centred on the country house with the caravan park adjacent, taken from the SSW. View of upper stages of tower house from courtyard from NW. 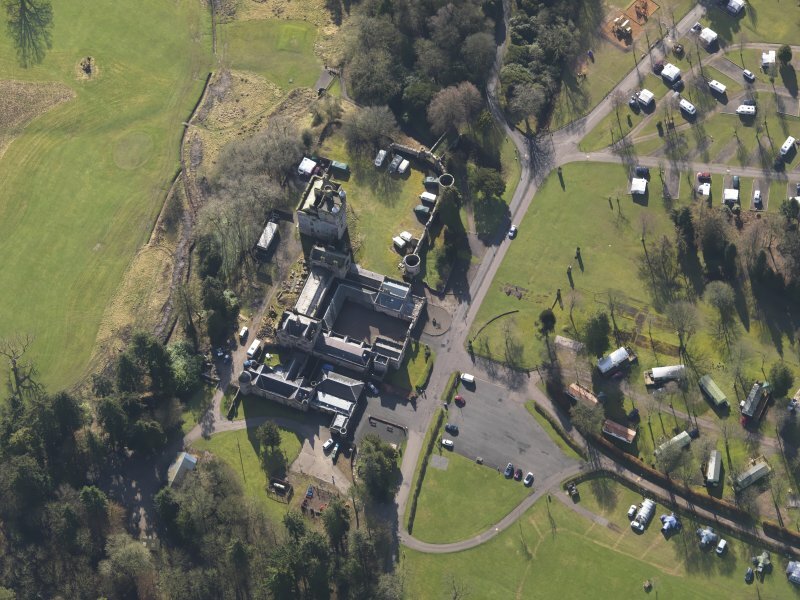 Oblique aerial view of Hoddom Castle, looking NNW. 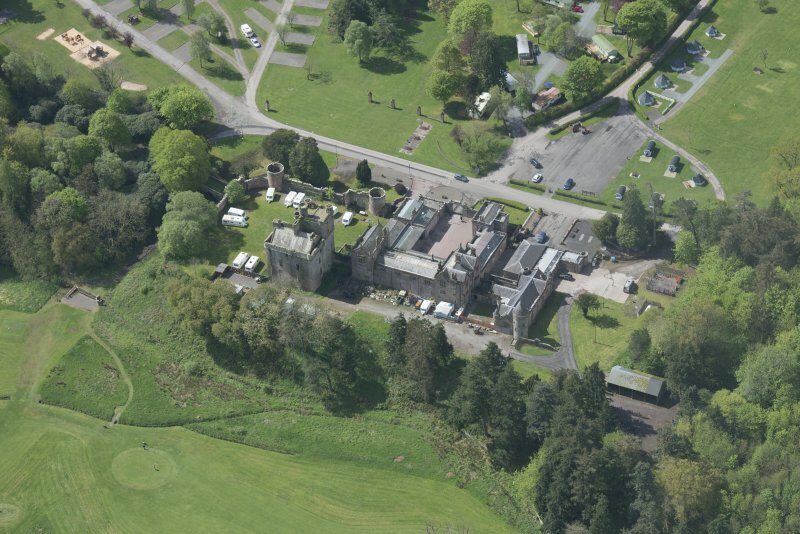 Oblique aerial view of Hoddom Castle and Hoddom Castle Golf Course, looking NE. 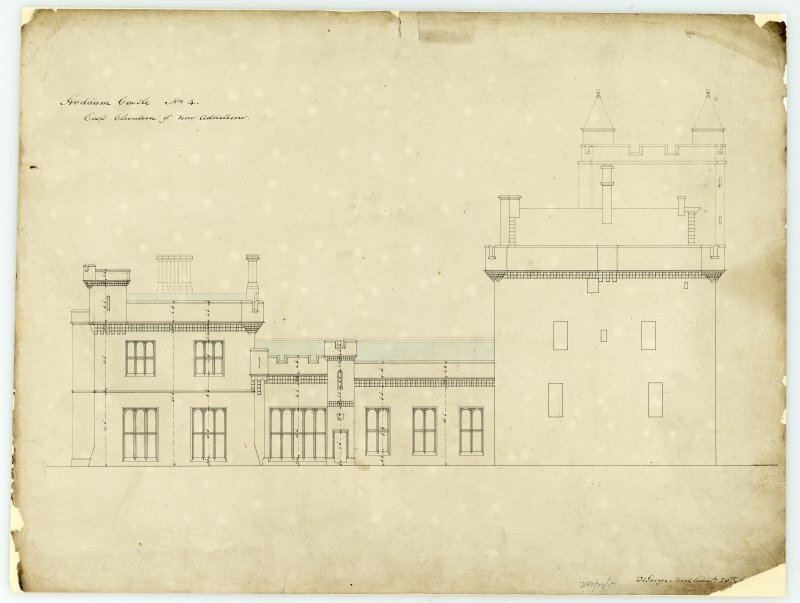 Drawing showing south elevation of new additions, Hoddom Castle. 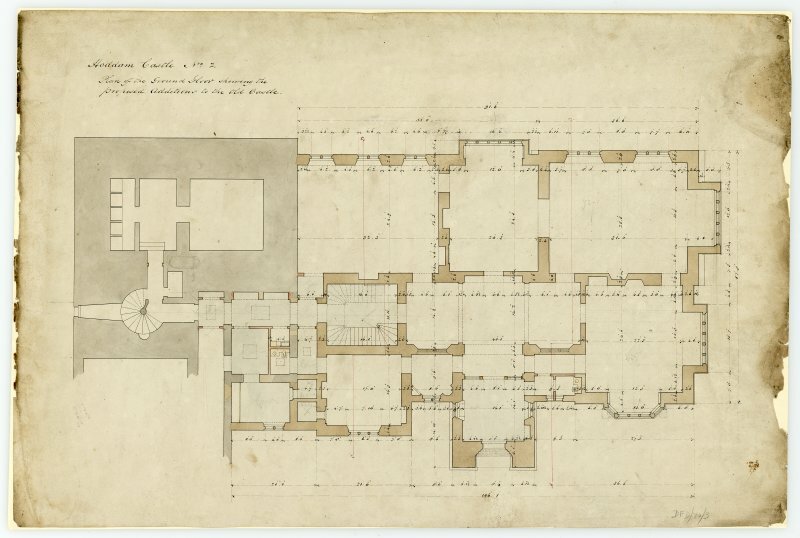 Drawing of bedroom floor plan over drawing room, Hoddom Castle. Drawing of ground floor plan showing proposed additions and alterations to tower house, Hoddom Castle. 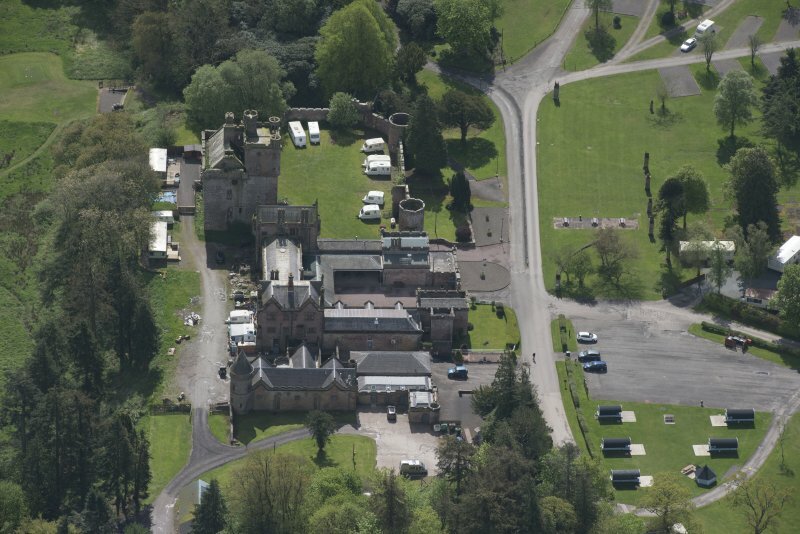 Oblique aerial view of Hoddom Castle, looking E.
Oblique aerial view centred on the country house with the caravan park adjacent, taken from the SW.
General view of tower house from N.
Oblique aerial view of Hoddom Castle, looking SSE. 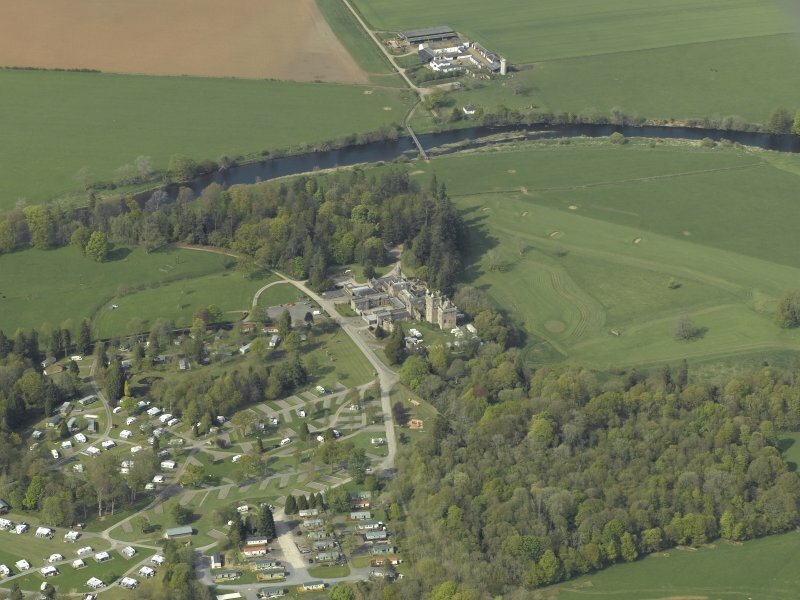 Oblique aerial view of Hoddom Castle and Hoddom Castle Golf Course, looking N.
Oblique aerial view centred on the country house with the caravan park adjacent, taken from the NE. 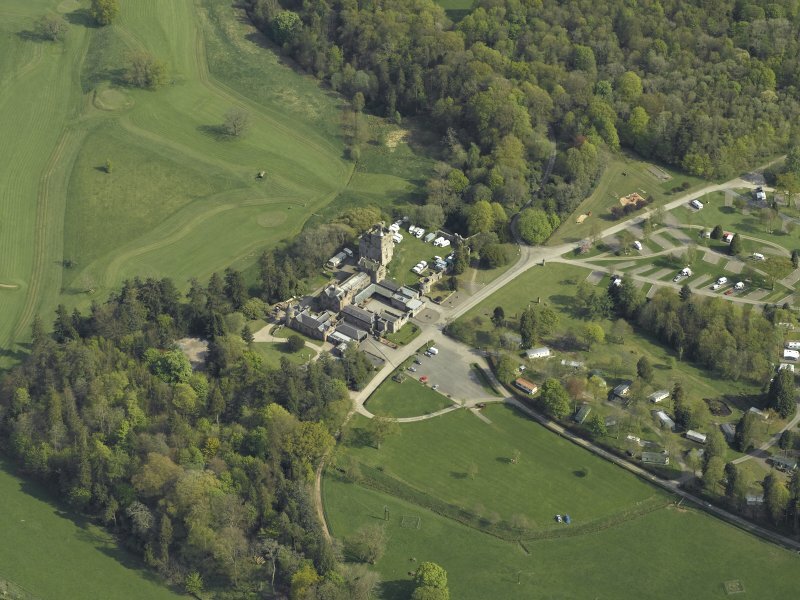 Oblique aerial view centred on the country house with the caravan park adjacent, taken from the E.
For West Lodge and gate piers (NY 14878 72966), see NY17SW 34. For Roman altar and (later) cross-fragments from the Knockhill summerhouse, which were apparently removed to Hoddom Castle and buried beneath the E drive (apparently at NY c. 1565 7283), see NY17SE 45 and NY17SE 64. Hoddom Castle is as described. 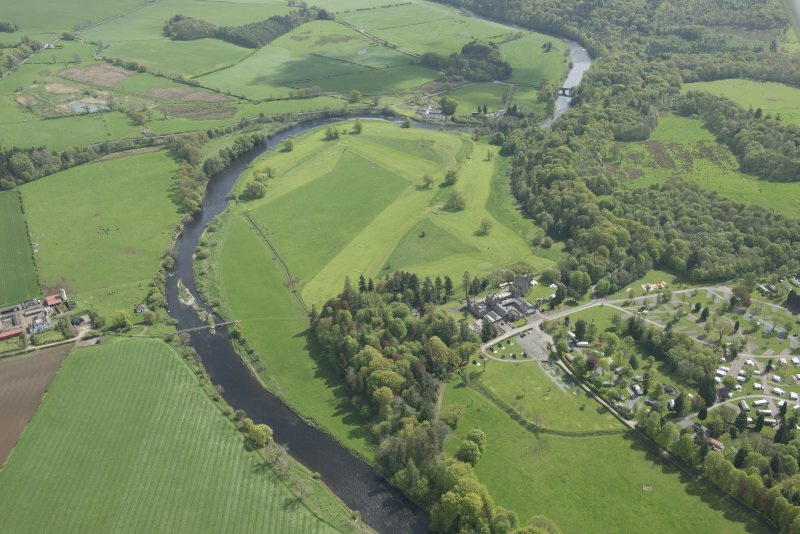 The portion of moat to the SE is 5.0m deep. Visited by OS (IA) 22 February 1973. Hoddam belonged to the Herries family of knights who served the Bruces, and then passed to the Carruthers. 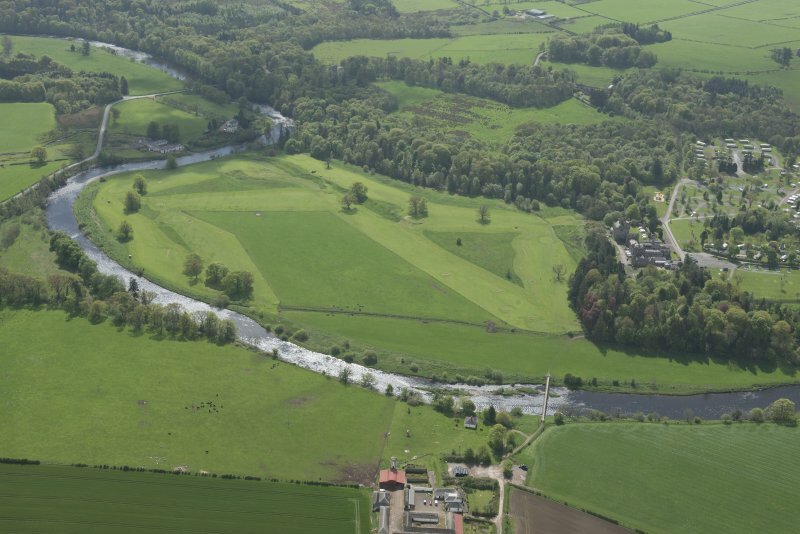 The massive L-plan tower rising above the River Annan was built by Jihn Maxwell, Lord Herries, soon after he obtained possession in the mid-16th century. 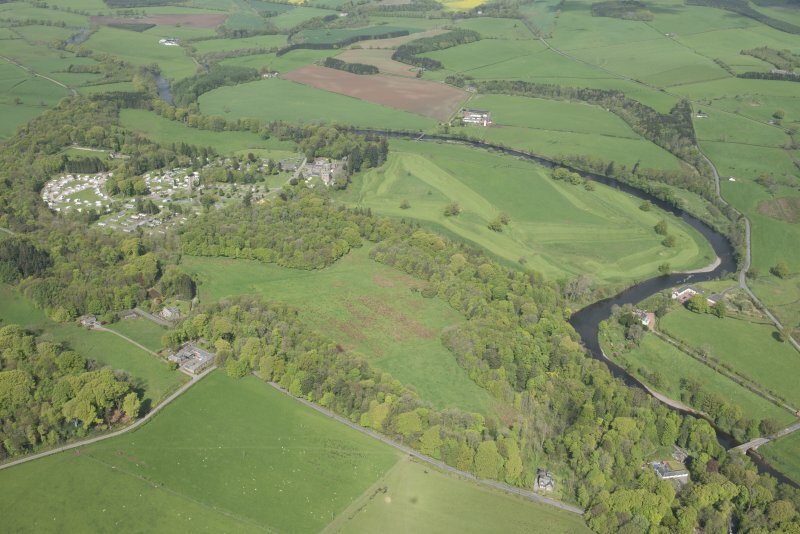 It was regarded as a place of some strength but in 1568 an indifferent garrison surrendered the castle to the Regent Moray after a one day siege. 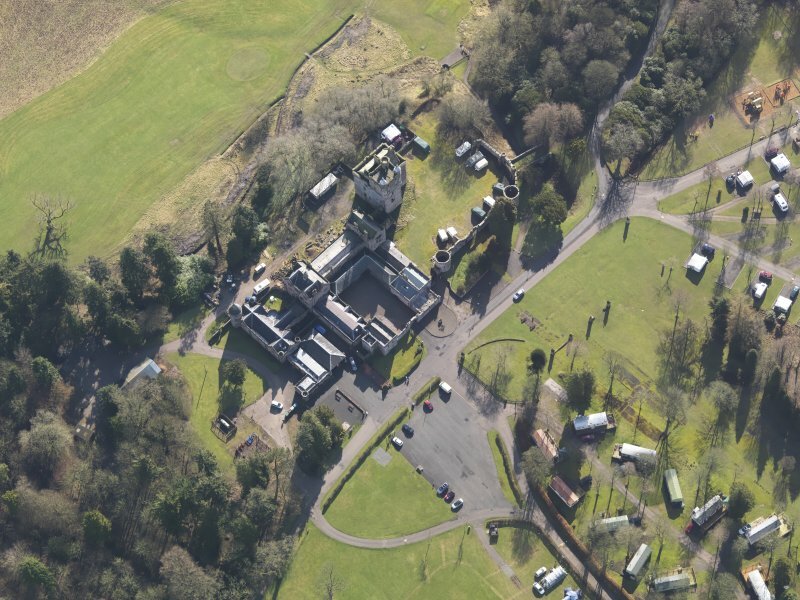 He handed it over to Douglas of Drumlanrig to serve as headquarters for the office of Warden of the Scottish West March, but in 1569 Hoddom was recaptured by forces loyal to Queen Mary. 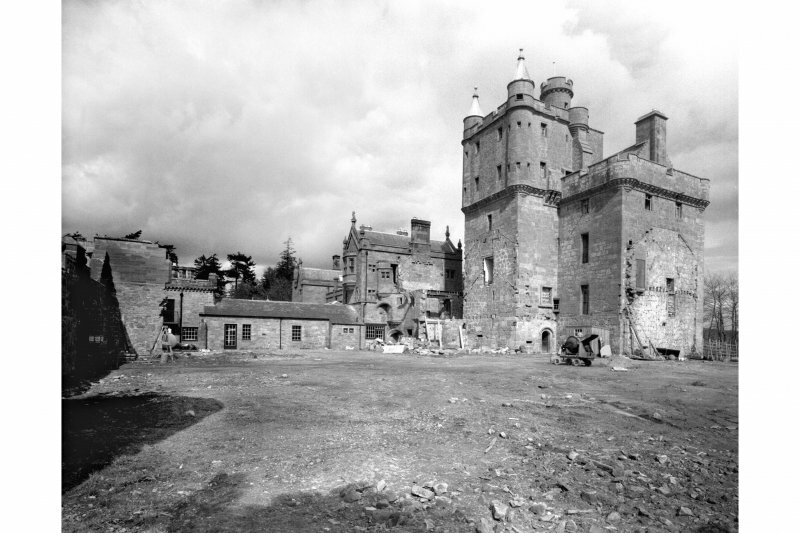 In 1570 the English commander Lord Scroop captured and blew up the tower. 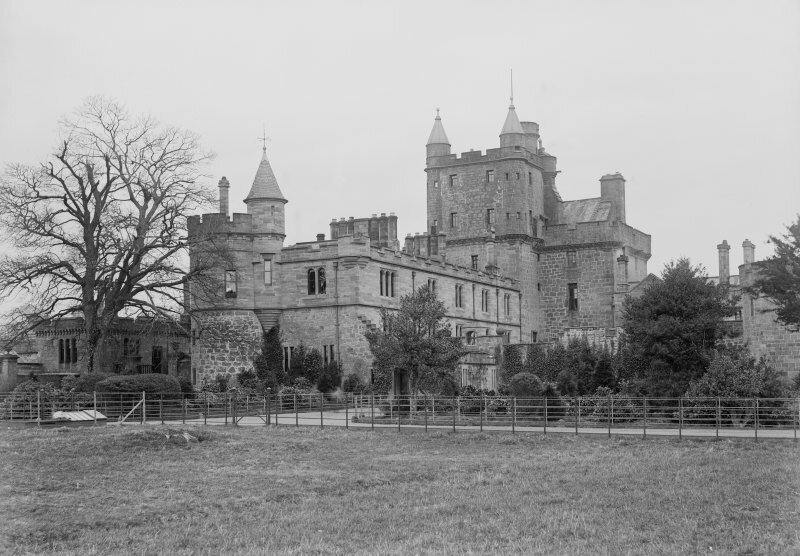 It was restored, and further remodelling was carried out after Sir Richard Murray obtained Hoddam from the 6th Lord Herries. 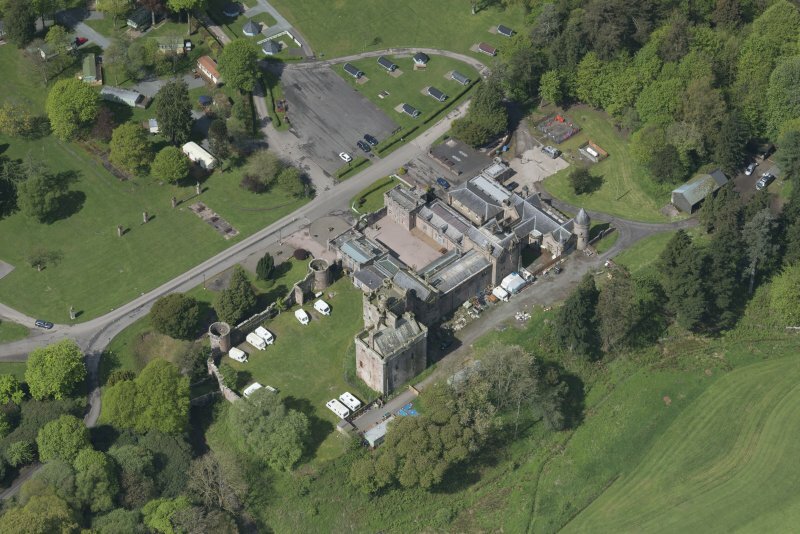 It passed to the Earl of Southesk in 1653 and to the Sharp family in 1690, and was later held by the Brooks. Hoddom Castle now lies derelict on one side of a caravan park. Demolition of a lower later wing has left a scar on the south end wall of the main block, which measures 15.5m by 11m and has four storeys and an attic surrounded by a wall-walk 15.3m above ground. 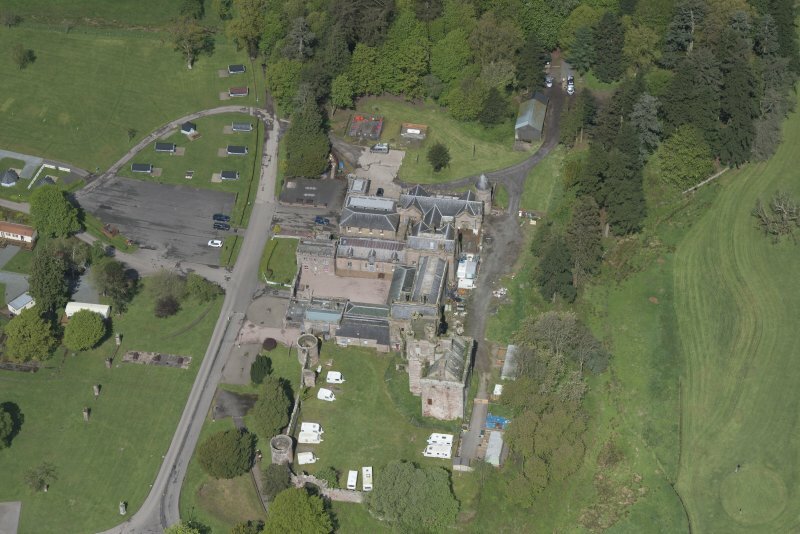 The ornamental coursing carrying the parapet and round bartizans continues round a wing 8.7m wide and 22m high. 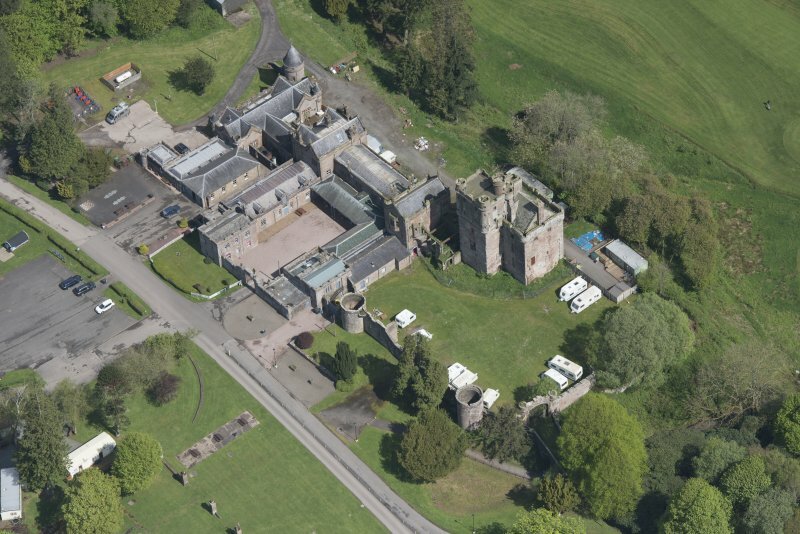 The wing has two full stories above the coursing and ends in a flat roof with an open bartizan at the SE corner, conical roofed bartizans on the W corners and a higher staircase turret on the NE. Below the foot of the stair is a prison. The entrance doorway has a segmental arch and a bold quirked edge roll moulding with a fillet. the label above the doorway is a big cable with mutilated knotted stops. There is a much-altered 17th-century courtyard wall on the S and E. Much of the dry moat has now been filled in. On the second floor, beside a remodelled fireplace in the SSE wall, and not noted in the published Inventory description, there is an aumbry which still retains its original 16th-century oak frame, door and iron fittings. The frame of the door (which comprises four members and a muntin) is morticed, and the tenons are pinned in place with dowels; the two panels are joined by a tongue-and-groove and wrought on the arris with a mitred chamfer. The wrought iron tee hinges and the leaded clasps retaining the butted frame have butterfly terminals while the arms of the two hinges bear mid-length rosette expansions. 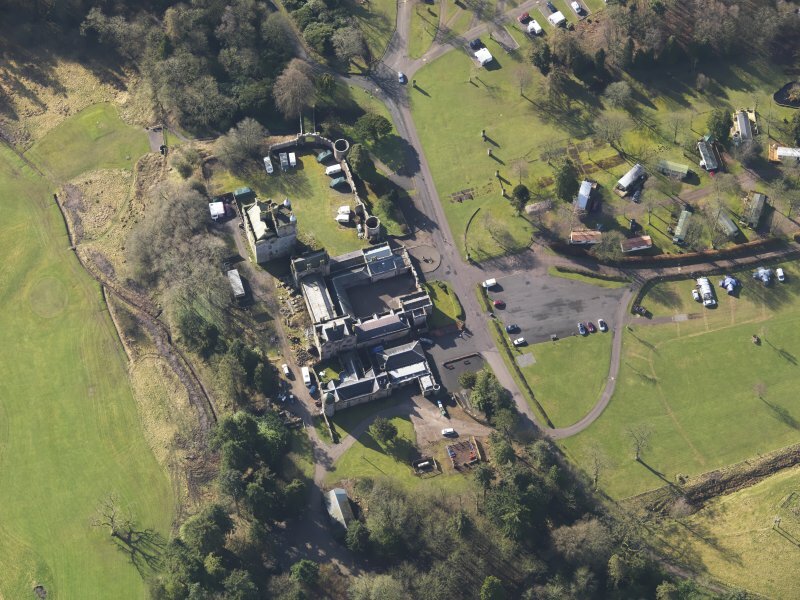 Visited by RCAHMS (IMS), 15 October 1993. 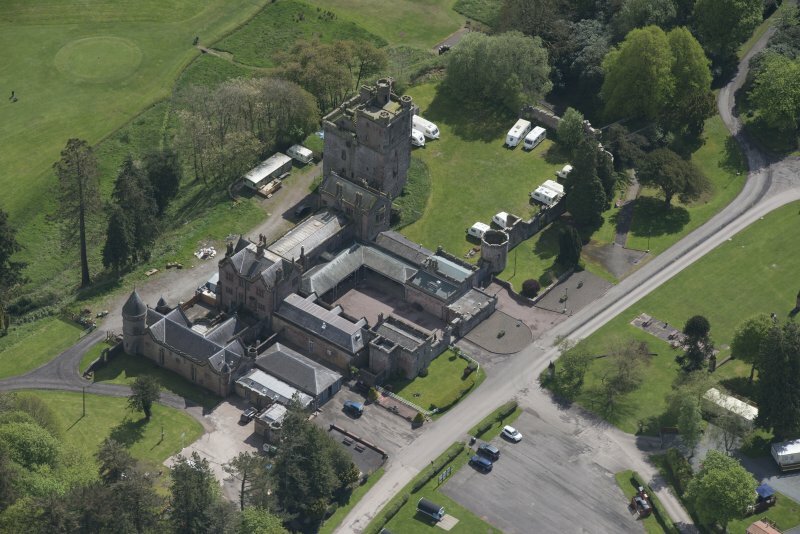 Architect: William Burn, additions and alterations. Further additions, 1879-91, including Wardrop and Anderson, 1886-88. Additions and alterations partially demolished. 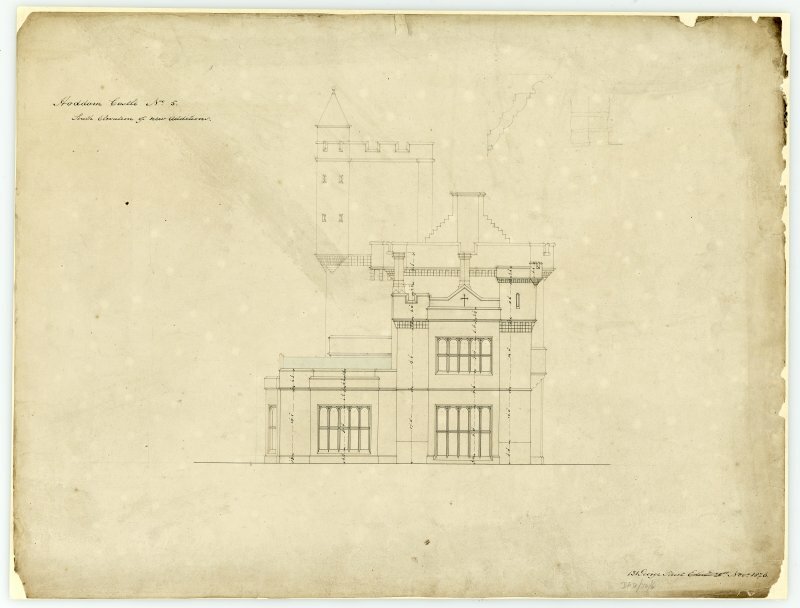 Miscellaneous File: Typescript list of drawings by William Burn in Royal Institute of British Architects' Drawings Collection, London. Miss I.H.K. 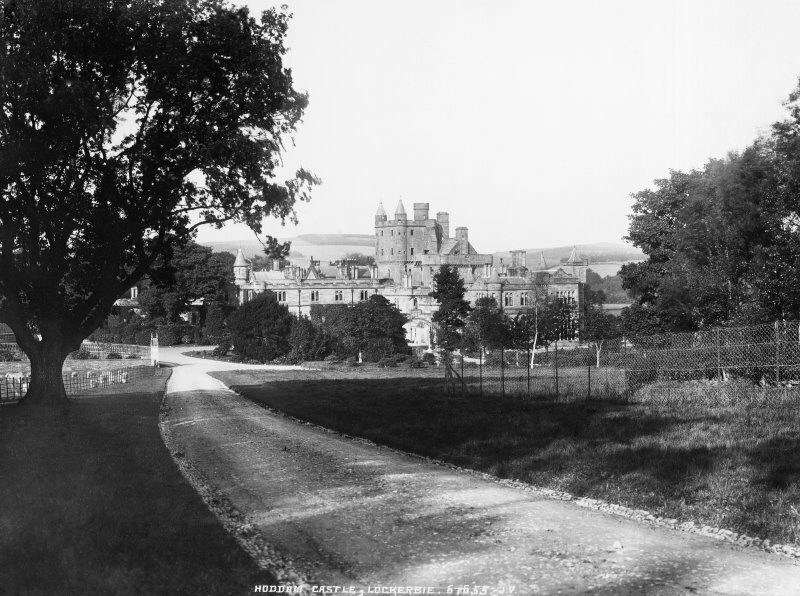 Beattie, architect, Dumfries: sections and elevations of tower, photographs. 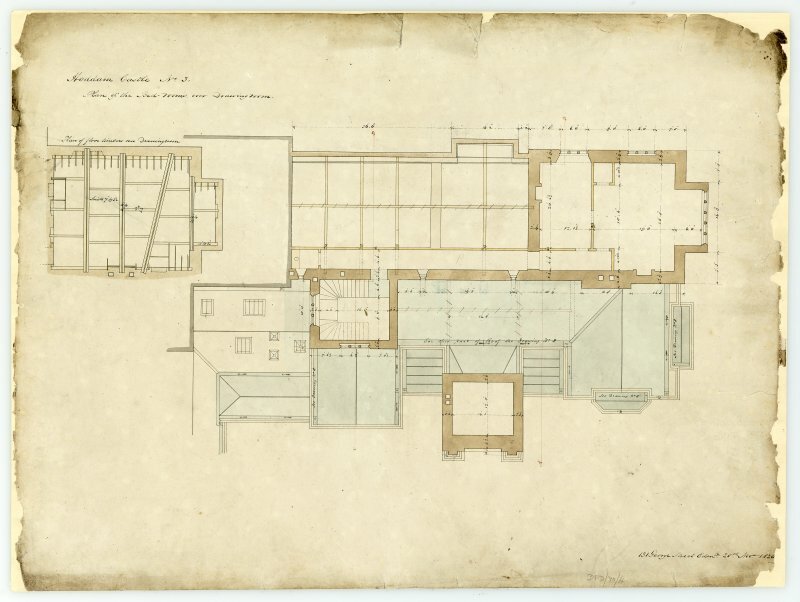 Additions and alterations by William Burn. 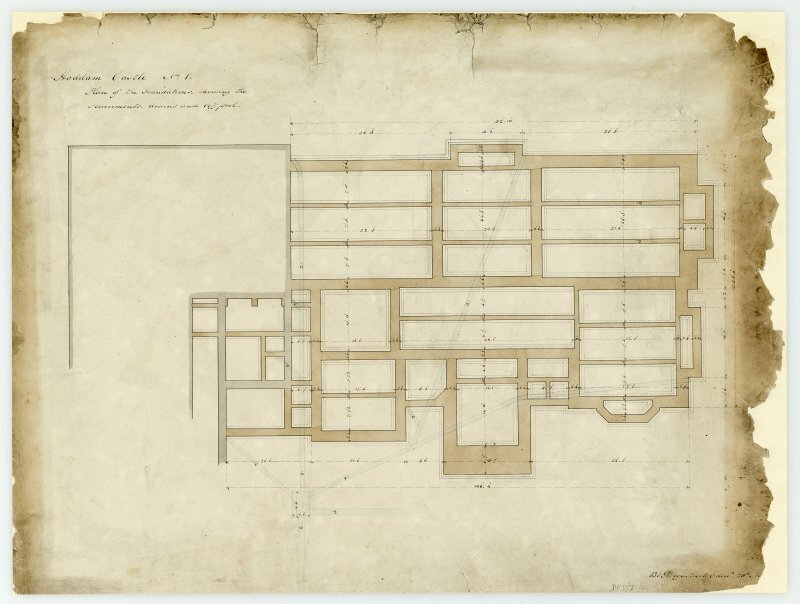 Measured drawings from 1826. 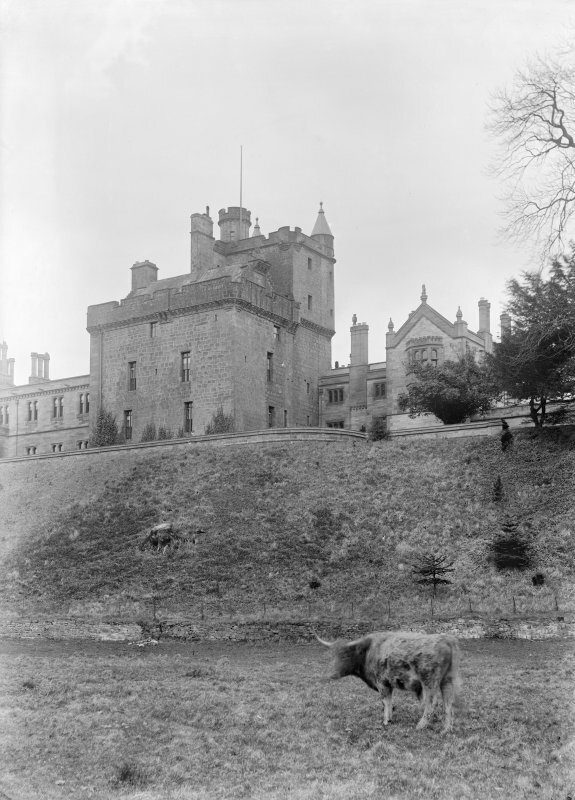 Towering over its courtyard, the huge mass of Hoddom Castle bears the scars, not of war, but of 19th century additions lately demolished. 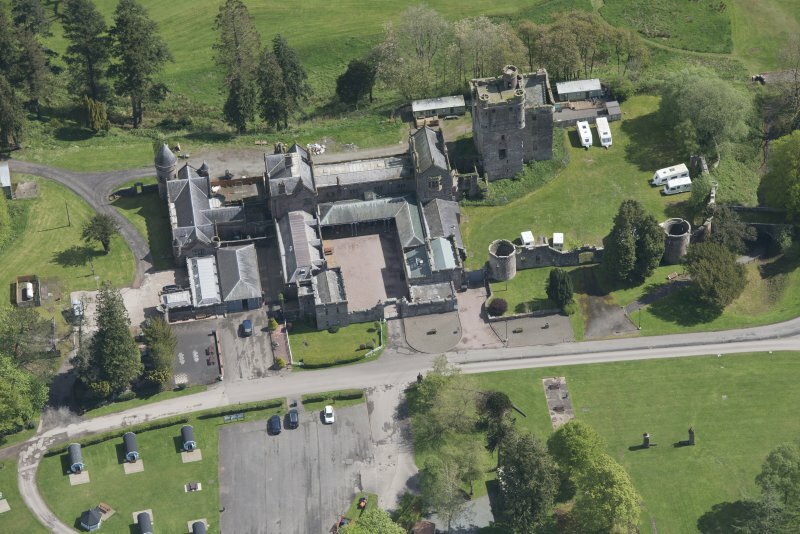 However,long before the castellated additions of 1826-7 were ever thought of, this was a building which had seen real military action, having been vigorously attacked three times within the first few years of its existence. 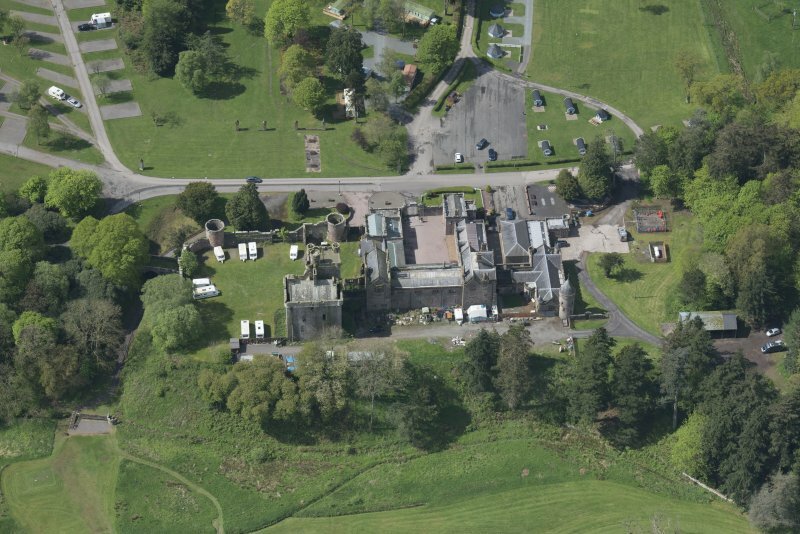 Replacing an older castle on the opposite bank of the river, Hoddom was built by John Maxwell, 4th Lord Herries, shortly before 1568 as his chief residential stronghold on the West March. 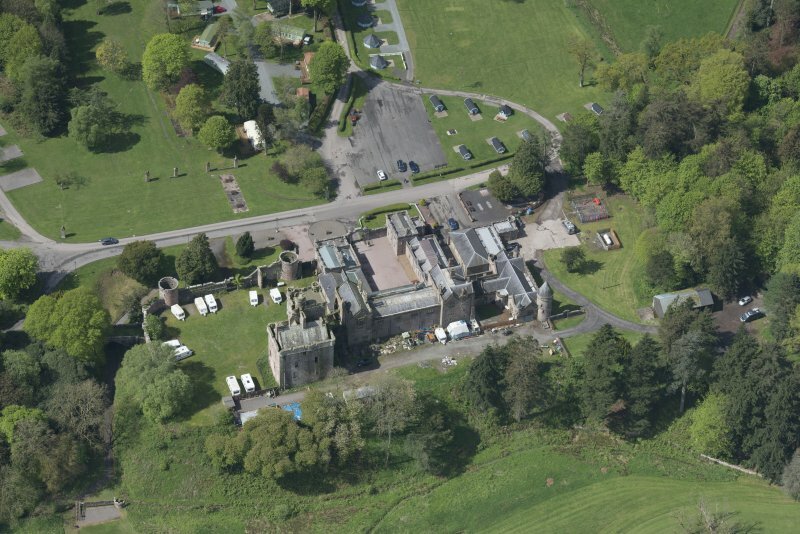 For its date this is a massive structure, standing to a height of over 21.3m with walls 2.7m thick at base. In conception it is akin to older generations of ' power houses' such as Comlongon (no. 37), but externally is distinguished from them in its liberal provision of gun-ports and in the decorative carved treatment of its corbelling and door-surround. 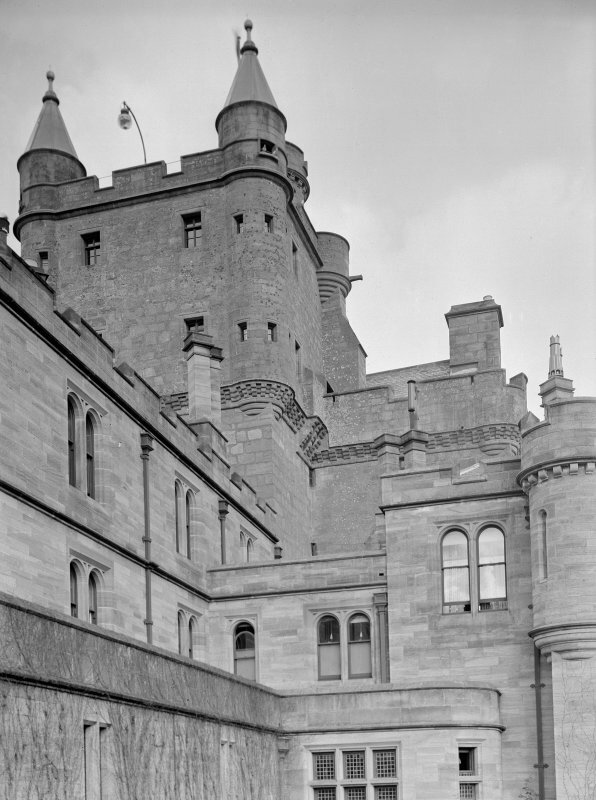 Viewed from the caravan park, the later heightening of the turreted wing obscures the castle's highest original feature, a beacon platform corbelled out from the apex of the north gable. The purpose of this was explained in the Border Laws which enjoined that 'ever in war and in peace, the watch to be kept on the house-head; and in war the beacon in the fire-pan to be kept and never fail burning, so long as the Englishmen remain in Scotland; and with a bell to be on the head of the fIrepan which shall ring whenever the fray is, or that the watchman seeing the thieves disobedient come over the Water of Annan, or thereabouts, and knows them to be enemies'. The platform at Hoddom is especially significant because it can be related, uniquely, to a watch tower which stands on the summit of Trailtrow Hill to the south. 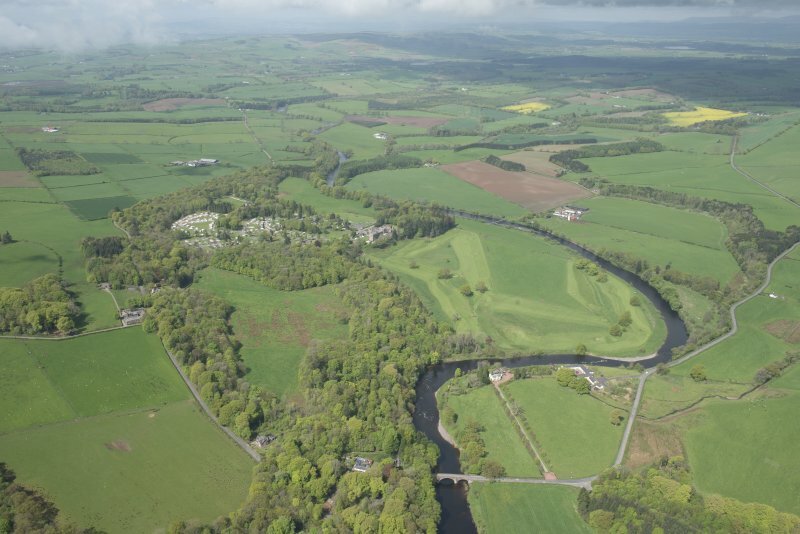 Compared to its parent in the valley below, this tower is a diminutive oblong structure of three main storeys, but from its vantage point commands a very extensive view of the lower reaches of the Annan and the Solway shore. 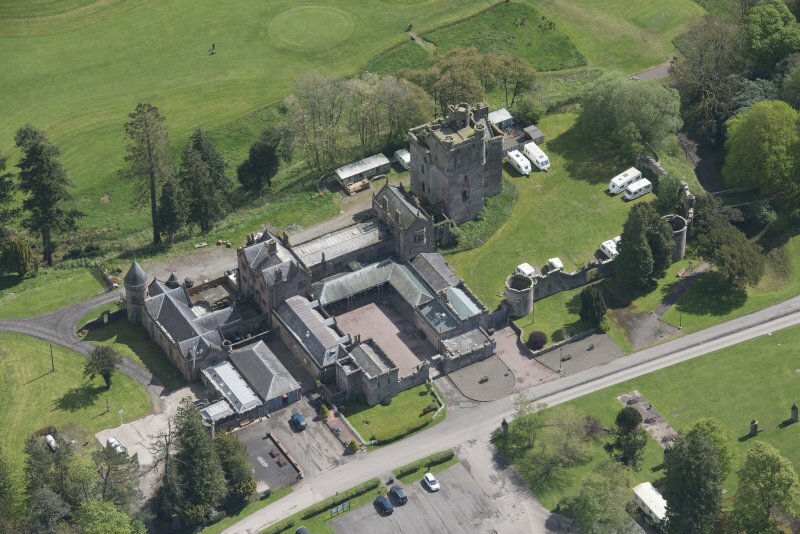 It too was built by John Maxwell, 4th Lord Herries. 'REPENTENCE' is carved on the door lintel, possibly a token of regret for the fact that it was built out of the remains of a demolished chapel in whose burial-ground it stands. It was evidently useful. In 1579 Maxwell recommended that 'the watch tower upon Trailtrow, called Repentance, must be mended of the little defacing the English army made of it [probably in 1570]; and ... the great bell and the fire-pan put on it ... '. 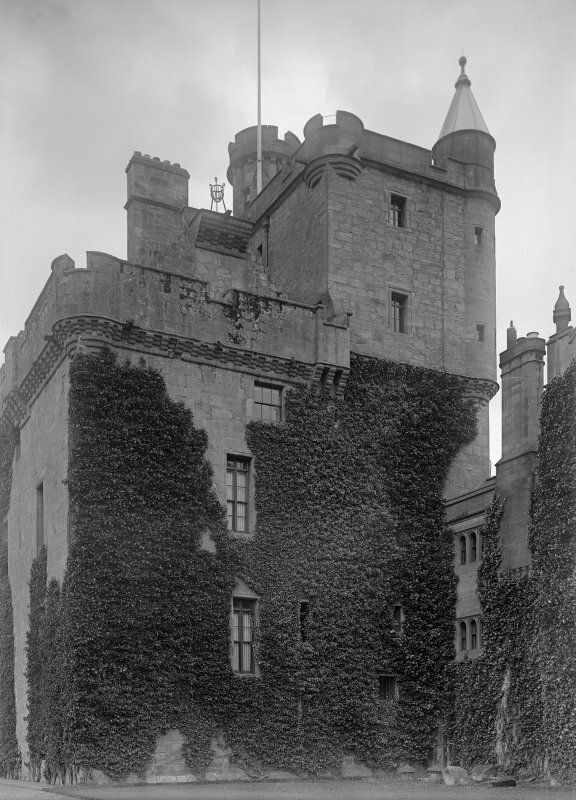 The parapet was reconstructed in the early 18th century, and the upper floor fitted up as a dovecote, an unconscious symbol of peace and changed attitudes towards the 'Auld Enemy'-or was it?